On Hanukkah, we recount the story of how Mattathias and his sons won a great victory against the Greeks, who tried to impose their own form of religious worship on the Jewish people. The battle took place more than 2,000 years ago but we continue to commemorate the event because it saved our people from destruction and allows us to practice our religion as we see fit. But there’s more to the story than the valiant struggle of the Maccabee men. According to many historical accounts, a woman also played a vital role in the success. Because I have two daughters, I always thought it was important for them to know this story and to understand that both men and women were and continue to be responsible for religious freedom. So I told them the story of Judith, daughter of Yochanan the high priest, and aunt of the Maccabees. Long-standing tradition has it that Judith visited Holofernes, a general in the Greek army, on the pretext of asking for personal protection. He was so taken with her beauty that he asked her to dine with him. During the meal Judith fed the general great quantities of cheese, which made him thirsty, so she kept offering him more wine. Holofernes drank so much wine that he fell asleep and Judith beheaded him with his own sword. Thus was she able to tell the Maccabees when to strike. Since the fateful victory, through the centuries we have celebrated Hanukkah by exchanging gifts, singing merry songs, playing games and eating lots of good foods. As far as the food is concerned, almost everyone associates Hanukkah with fried foods, especially potato latkes. Food fried in oil is a remembrance that when the soldiers went to rededicate the Holy Temple, the oil they found there was only enough to burn for one day, but miraculously, it lasted eight days. But it is also the custom among some people to serve foods that contain cheese — in honor of Judith. In my house Hanukkah goodies always include two kinds of latkes, potato and cheese, and at some point during the 8-day holiday there’s usually a fabulously rich New York cheesecake for dessert. 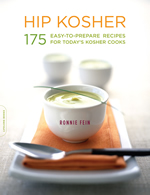 The recipe for Lemon-Cottage Cheese Pancakes is from my book Hip Kosher, and is one of the variations of cheese latkes I make during the holiday (actually these pancakes are so light and tender I serve them over and over again throughout the year for weekend breakfasts). The grated lemon peel gives ordinary cheese latkes a vibrant, citrusy taste; if you prefer, use orange peel instead or add a pinch or two of cinnamon. You can even add bits of this or that to the batter: dried cranberries, chopped nuts and so on. 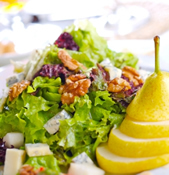 Pear and Blue Cheese Salad is a sophisticated choice for a holiday lunch or dairy dinner. It looks lovely on the plate, so if you’re entertaining, use it as a first course in a fish dinner of, say, roasted salmon or cod. The New York Style Cheesecake would make a wonderful choice for dessert. This is the authentic, hi-cal cheesecake of old. It is rich and creamy and your tongue will welcome every bite. Yes, it contains full fat cream cheese, cream and sour cream, but is satisfying after a light dinner of salad and fish. New York Style Cheesecake has lots of citrus flavor that balances the richness of the other ingredients. I often add more than the recipe calls for because we like the cake orange-and-lemony. But you can cut down on the amounts a little (and add 1/2 teaspoon more vanilla extract) if you prefer a plainer taste. This year, why not try some cheese dishes in addition to the potato latkes. Let’s remember Judith!